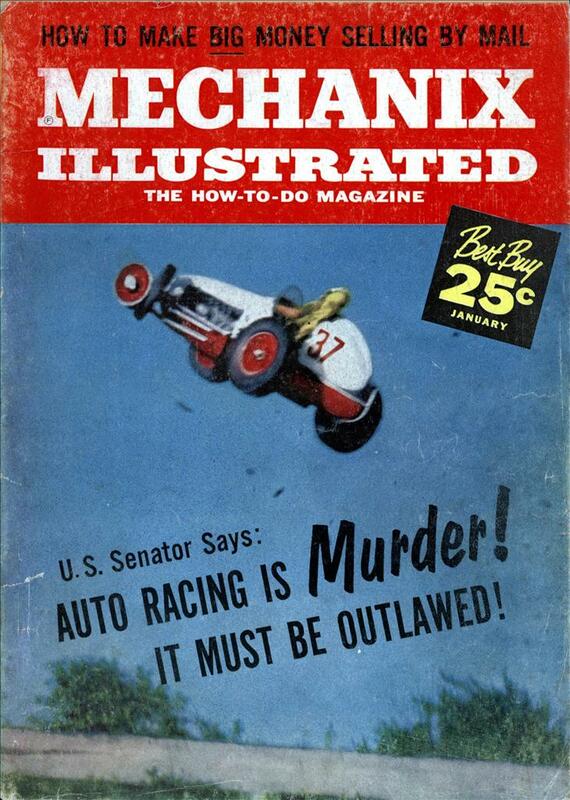 AUTO RACING MUST BE OUTLAWED! IT happened recently in my home State of Oregon: A car driven by a young automobile race driver hurtled out of control at Portland Speedway and crashed into a retaining wall. Don Porter, father of four small children and himself only 31, died violently. Six weeks earlier at the Indianapolis Speedway, a car went out of control and immediately caused a dozen others to pile up. Headlong into the traffic jam rushed Pat O’Connor of Indiana. Unable to stop, he plowed into the rear of a car and flipped over. Young O’Connor’s car burst into flames and he perished in the wreckage. And two days after this, a Porsche-Carrera driven by Hodge Bruch turned over three times during a race at Bridgehampton, N. Y. Bruch, father of three, died on the way to a hospital. Some people call this sport. I call it wanton, tragically unnecessary bloodshed. Some call it healthy, exhilarating competition. I call it shameful and uncivilized. The three deaths I have described are only the latest in a long, macabre list which stretches back over the years almost to the very start of automobile racing. Every step of the way, car racing has been accompanied by massacre. Tracks all over the country have counted—are still counting!—their dead. I believe the time has come for the United States to become a civilized nation and to stop this carnage which has persisted too long. I believe full study should be given to outlawing automobile racing, once and for all, by legislation effective in all 49 states. There are a number of reasons why I am convinced this must be done. In the first place, the exhibitions are degrading to the human spirit. I do not pose as a psychologist, but is there any serious doubt that the majority of persons who throng to these proceedings are there because of the extreme hazard to the drivers? For every spectator who really understands and loves automobiles, there are a hundred who come be- cause men are in constant peril of being killed or mangled. And this, to me, is pathetic. It is a lowering of the essential dignity of man. It approaches dangerously close to the raw crowd lust of the Roman “circuses” where the populace jammed the arenas to watch gladiators battle to the death. We toss critical barbs at the Spaniards because of their bull-fighting. We roll our eyes heavenward and shudder at the goriness of this national sport. And yet how many bull fights are as bloody as the race not long ago in San Diego, Calif., where a woman driver died hideously and newspaper photographers took pictures of her hand protruding agonizingly from beneath her over-turned racing car I have heard and read many criticisms of some films, TV programs and books because they expose our children to violence. Yet we permit our youngsters to visit automobile race tracks. Is not the impact of a supposedly violent tele- vision show upon an impressionable young mind comparatively mild compared with the effect of a roaring, rendering crash in which racing drivers are slaughtered or maimed? My second reason for urging abolition of automobile racing deals with the danger to the lives of the participants. Does it make any sense to permit continuation of a sporting activity when the death of a driver or two in a major race is considered normal? In a recent discussion of the subject in Harper’s Magazine, Prof. Laurence Lafore of Swarthmore and Robert W. Lafore quoted a peril exists for drivers of cars who roar around tracks at great speeds and jockey wildly for positions. Anything can happen as tires and brakes, vital to safety, take gruelling punishment. If it doesn’t happen, Providence alone can be thanked. And now we come to still another danger—the risk to the spectator. Fortunately, we have not had any catastrophe in this country similar to the flaming death which snuffed out the lives of 82 persons at the famous 24-hour Le Mans race in 1955—not yet. But are we absolutely certain it can’t happen here? I’ll ask this question: In all the auto racing tracks of the country, are the spectators completely and sufficiently safeguarded against disaster such as befell the onlookers at Le Mans that tragic day? Is there no possibility that such a catastrophe could be repeated in one of America’s races? The world won’t ever forget what occurred at Le Mans. Approximately 250,000 persons were watching the race. About three hours after the contest began, an Austin-Healey driven by Great Britain’s Lance Macklin swerved to avoid a Jaguar driven by Mike Hawthorn. Coming down fast was Pierre Levegh, driving a Mercedes. The Mercedes couldn’t veer or brake in time. It struck the Healey in the rear left corner and took off crazily. It hit an earthen embankment on the side of the track and somersaulted over and over for dozens of yards. The driver was hurled out and instantly killed. As it spun, the car exploded and pieces flew into the crowd like a fragmentation bomb. The effect was devastating. About 20 persons were mercilessly decapitated by the flying hood. The engine and front axle hurtled into another section and killed dozens more. Others were burned to death as the car’s flaming body descended on them. The toll: 82 dead, 78 injured. Could it happen here? I think that if we cannot answer that question with an unqualified no, we are not justified in permitting the continuance of this sport in our country. Why wait until a disaster happens before we clean house? If, through the tragedy that came to another nation, we have been taught a sobering lesson, isn’t it foolhardy not to pay attention? There’s a tragic footnote to the Le Mans horror. The French authorities took all sorts of precautions for the following year. With all the precautions, a man was smashed to death and some dozen cars crashed, flipped and skidded. This year’s race was no better. The crackups followed one after the other. One driver hit an embankment head-on. He caromed off as another came up. The driver of the first car was killed. I am primarily concerned over the adverse impact of automobile racing on the psychology and attitude of youthful Americans. Racing tends to glamorize speed and dare-deviltry in automobile operation, an attitude completely at odds with efforts to install safe-driving principles in the minds of young drivers. Hundreds of thousands of dollars are spent on safety campaigns. How much of this is dissipated by the adverse psychological impact of auto racing on young minds? There is something else about automobile racing which worries me. America is gradually becoming a nation of spectators. I would rather see Americans engage themselves in hiking, golfing, camping and bicycling than watching a handful of men —and even women—risk their lives wheeling racing cars around a track. The President’s Conference on Physical Fitness has demonstrated worry over the health, stamina and athletic prowess of most Americans—and I share this concern. However, there are some bright spots in the picture. Already the most hazardous of all types of racing, the “open road” kind, has been practically abandoned in this country. These, as the name implies, are held over public highways, with spectators lining the roadsides as the cars zoom by. If we need any evidence that we’ve done the right thing by abandoning open road racing here, all we have to do is look toward Europe. It was just a year ago last May that Marquis Alfonso de Portago was streaking along during the Mille Miglia when either a tire blew or an axle broke. His car, a Ferrari, swerved, uprooted a milestone and crashed into a telephone pole. An instant later, de Portago and his co-driver were dead. But the horror was far worse. The car had smashed into the dense crowds that lined the road and killed 13 spectators, some of them small children. If this isn’t enough to convince us we’ve done right, then all we need do is look toward Cuba. Last March, during the 315-mile Gran Primo de Cuba race, a young driver took a shallow turn, skidded and ran into a crowd. In a moment, seven were dead and 31 injured. There is another bright spot in the American auto racing picture. In 1957, the Automobile Manufacturers Association recommended that its member companies (General Motors, Ford, Chrysler, Studebaker-Packard and American Motors) cease all participation in car racing. The AMA directors, meeting in Detroit, recommended in a resolution that the companies no longer enter cars in the various competitions held throughout the country, including stock car racing. And this brings up one final point. Promoters of auto races say that these contests are essential to the technical development of various advances in car construction. They assert it’s necessary to run racing cars at great speeds in order to test new devices and gadgets for general use in passenger vehicles. I challenge this ridiculous claim. Even if this should be true, isn’t it perfectly obvious that the necessary high speeds can be achieved without running 20 or 30 cars simultaneously around a narrow track before huge audiences of spectators? Damn! took the words right out of my mouth too! You can smell a Democrat a mile away! 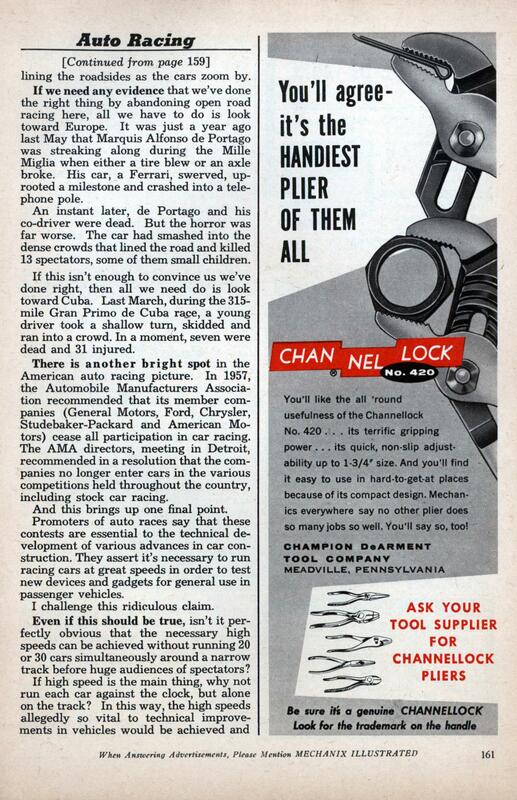 He was exactly correct about there being insufficient safeguards for both drivers and spectators, though. This was only four years after the 1955 Le Mans disaster, so it’s not surprising that he’s still so upset about it. I doubt the spectators would have been very enthusiastic to pay for their tickets if they’d known that a pretty unremarkable accident could so easily cause half of a car to slam through the crowd and kill more than EIGHTY people. Today, it’s downright hard for a driver to kill himself in even amateur race meets, let alone the big-money pro races. It’s close to impossible for racetrack drivers to kill a spectator (although rally drivers, of course, still can). If you believe it was all bleeding-heart Democratic do-gooders who forced these changes to happen, I think you need to check your history. Daniel Rutter: Hardly. The good Senator wasn’t offering changes but an outright ban, I believe. For the record I’m not a fan of Republican do-gooders as well. Leave it to a bunch of morons to bring politics into the discussion. Jenkins it is all about politics. The problem is that most people think parties when they think politics. The Senator was from Oregon. Not a state with a lot of companies that make money off the Auto industry. Not a lot of race tracks that held big money races. It was easy to attack and who could be pro death and destruction. BTW politics and politions did NOTHING to make racing safer. It was the drivers and car owners that did. People don’t want to see their friends die. BTW I am a motorsports fan. I hate crashes. I watch to see the skill of the drivers. You do not get new race records when you have crashes. Jenkins: Just statements of fact, sweetheart. Thanks for playing. We may be morons but we’re organized! Speaking of morons, it’s a US Senator talking about legislation and we brought politics into it? I would like to read Tom McCahill’s response to this. Old Tom, I’m sure, unloaded on the Senator. If anyone out there has the Feb. ’59 issue, it would be great to have the response posted here. Firebrand, you know what I was talking about when I said politics. I guess I should have said “partisan” instead. Jenkins: How would I know that? I flunked Mind Reading 101 in college, being a moron and all. I would like to read Tom McCahill’s response to this. Old Tom, I’m sure, unloaded on the Senator. If anyone out there has the Feb. ‘59 issue, it would be great to have the response posted here. Mr. Levegh’s driving partner, John Fitch, was in the pits at the time of the 1955 Le Mans accident awaiting his turn to drive. Fitch would eventually create the “Fitch barrier”, which we may all have seen at the exit point at many freeways as a row of yellow barrels filled with sand or water. and the threat of having their sport banned had nothing to do with that? not even a little bit? Yeah, protecting us from ourselves. This is positively disgusting. Politicians tapping the hysteria of old women for their own purposes.